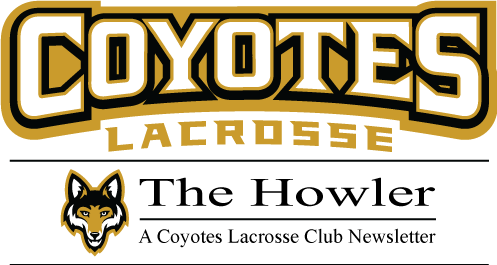 April is a busy lacrosse month for the Coyotes club. Many of our teams have two games a weekend and traveling around the Bay to play tough competition. Last weekend, we kicked off our Spring Pups program with fifty-five Kindergarten and First Grade boys and girls! In the past few years, this has been an incredible feeder program for our club allowing families to learn about lacrosse in a “clinic” style. As the club continues to grow in numbers, we want to strive to keep our small community feel among the players and parents. One opportunity we want to encourage is having the older players from U13, U15, and alumni volunteer their time to help with our younger teams. If your child is interested in helping coach the U9 Boys/Girls or Pups please reach out and let us know. Remember to arrive on time for practice and have your player fully dressed in equipment before letting them on the field AND arrive 30 min. before game time to be ready to warm-up! Start the discussion with your team and enroll together! Camp is more fun with your friends and teammates!